The Physical world of materials and understanding how things & the world around works. The Socio-Emotional world consisting of the human world and the society. Survival Skills: Reading, Writing, Arithmetic, Computers, Fitness & Health, Safety, Money. Life Skills: Confidence & Self-Esteem, Freewill, Independence & Fearlessness, Integrity, Respect & Tolerance. Questioning/Thinking Skill: the ability to ask why. Fountainhead is currently running classes from Nursery to Grade 12. We are implementing the International Baccalaureate Organization (IBO) till Grade 12. Fountainhead School is an authorized* school for the Primary Years Programme (PYP) and the CIE. The school is certified as an International Baccalaureate (IB) World School. These are schools that share a common philosophy and commitment to high quality, challenging, international education that the school believes is important for our students. 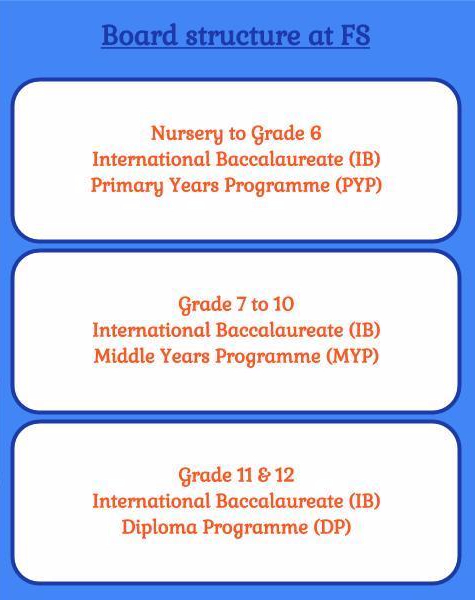 *Only schools authorized by the IB organization can offer any of its three academic programmes: the Primary Years Programme (PYP), the Middle Years Programme (MYP), or the Diploma Programme (DP). Our curriculum has been mapped with the national curriculum especially CBSE to ensure that we at par with them. Most of the topics covered in CBSE are included in our curriculum at different grade levels. Parents those who have a concern that IB students cannot appear for the national level entrance exams (JEE, NEET etc.) can click on the tabs given below to check the topics covered in our curriculum.